Je veux un petit frère. He wants an ice cream. Nous voulons une nouvelle voiture. Ils veulent manger des frites. They want to eat chips. "Voudriez-vous de l'eau" is acceptiable, if that's what you were thinking. It is actually more polite than simply "Voulez-vous de l'eau". -- Chris (not a native speaker). Not in this case, you would simply use the present tense in the question. Vous voulez de l'eau ? But the question doesn't need extra politeness, the fact you are offering water is enough. 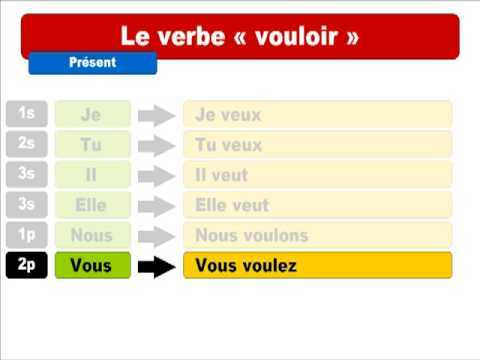 Why is it that "voulez-vous" is a more common translation of "would you like" than the conditional "voudriez-vous"? The French are generally very polite in sentence request phrasing and the use of le conditionnel is considered to be more polite, i.e. je voudrais, pourriez-vous, voudriez-vous. Loosely translated: I would like vs je peux I want, could you and would you instead of pouvez-vous, voulez-vous can you, do you want. Le conditionnel seems less abrupt. So what's your question? Isn't the answer right in the lesson? -- Chris. Sorry, I was too quick. You are asking about the Subjunctive. voudrais vs veux when to use which? Bonjour Darren ! Je veux means "I want" - it's very direct. Je voudrais means "I would like" - it's softer and politer, so you'd use it when ordering in a restaurant or shopping, for example.